In an effort to enable Muslim communities across the country to build inviting, resilient and relevant institutions, we conducted multiple focus groups with a diverse group of congregants and mosque leaders. Rather than try to “isolate all the problems” with existing institutions, we asked leaders and members alike to tell us about the most positive experience they’ve ever had and how this experience could be reproduced again and again in the future. What we heard surprised and inspired us. Second, we combed through all available survey data on mosques and Muslim attitudes. 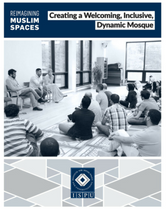 We turned reams of data and hours and hours of focus group research into a set of practical recommendations that mosques can implement right away. To illustrate how mosques can serve as hubs for hope, ISPU identified real life examples of American Muslim Institutions doing just that.